After five minutes with Mighty No. 9, I felt perfectly at home with its familiar brand of side-scrolling platformer gameplay. At the end of my 30 minute hands-on time during E3 2015, I was just sad that I had to put the controller down. For those of you who are wondering how the spiritual successor to the Mega Man series is shaping up, it looks like there is no need for concern. 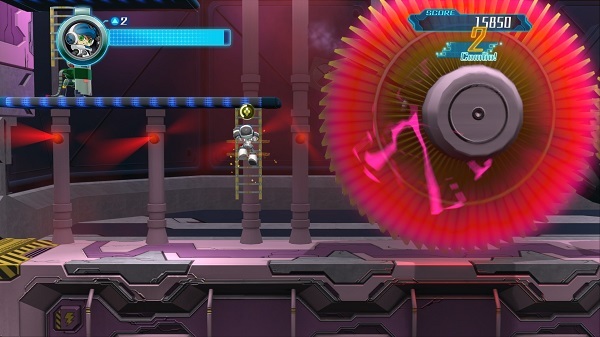 I only had the opportunity to tackle a pair of the game's levels but, if those frantic dashes through enemies aplenty can serve as a gauge, diehard fans of Keiji Inafune's most celebrated work and new fans alike might have something special to look forward to come September. For starters, Mighty No. 9 wears its inspirations proudly. I wouldn't fault a casual onlooker for thinking that it was actually the latest addition to that storied Capcom property, rather than a brand new game. You play a mostly blue-clad hero named Beck who, with the assistance of his cohorts Call and Dr. White, are tasked with taking down eight robot masters who are trying to tear the city apart. The game begins with the city's bots running amok. The company responsible for developing these robots, Cherry Dynamics claim that the sudden shift in aggression is all thanks to Dr. Blackwell's meddling. 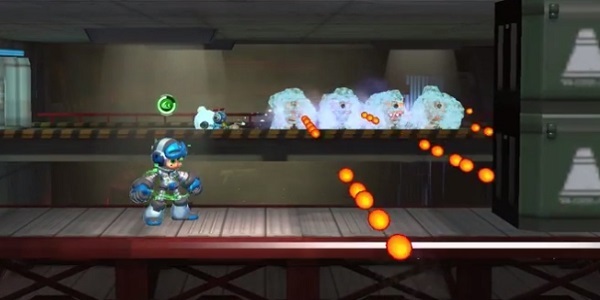 Similar to the Mega Man series, your job is to traverse various themed levels en route to taking out their similarly themed bosses. Rather than just shoot your enemies until they explode, however, Beck has the ability to stun and then dash through them to absorb their energy. Chaining more dashes and drains together ups your score and energy earned, rewarding those who are able to turn these simple mechanics into a break-neck sprint of robotic mayhem. The enemies are as varied as ever, each sporting their own movement and attack patterns. Learning each of their weaknesses and working around them frequently requires darting back and forth across the screen, making traversal and combat far more engaging than in traditional platformers. Beck also has the ability to dash between platforms and through tight spaces, as well as grab onto ledges in order to pull himself up to safety. The locomotion and combat feels like the perfect evolution of gameplay that Inafune made popular a couple of decades ago, rewarding speed and skill while still proving perfectly accessible if you want to take things nice and slow. Enemies aren't as numerous or obnoxious in their movements as in those classic games, either, meaning that your deaths feel like the result of human error and are therefore far less frustrating . There's still a nice challenge on offer, but at least I never felt like I was being overwhelmed because too many enemies spawned on the screen and dive-bombed my character in patterns that were nearly unavoidable. I had what appeared to be every weapon form available from the get-go, but I don't know if that's intentional or simply unlocked for the demo's sake. As a result, and considering the fact that I was playing the earliest stages, I decided to stick to the standard blaster to get a good feel for the combat. I took a moment to cycle through each form, though, and was pleasantly surprised by the fact that each elemental shift completely changes Beck's look and attack types, creating far more dynamic shifts than were ever on display in the Mega Man series. I expect these abilities to become an even bigger focus deeper into the game and look forward to seeing what types of strategies they open up. Mighty No. 9's first miniboss, a construction bot on a rampage. This battle was all about pattern recognition and positioning Beck so that he didn't take damage from various attack types while waiting for a good opening to fire. That dash move also came into play here, as I needed to capitalize on my attacks lest the bulldozer simply heal up from the damage my blaster was doing. Just like the standard gameplay itself, everything here felt like a fantastic mix of ideas both old and new. As Inafune has stated in the past, Mighty No. 9 feels like a game that speed runners will flock to. I'd argue there are about four ways to play the game. You can go at your own pace and just have fun, try to get to the end of each level as quickly as possible, try to earn the highest score, or try to get a mixture of highest score and fastest run at the same time. There's also the boss rush mode, additional challenges and more to pour your time into, but I wasn't able to check those modes out during my brief demo time. Other than a couple of crates oddly missing textures, Mighty No. 9 looks great in action and sports a soundtrack to match. The game is fully voiced, too, adding a fun Saturday morning cartoon flair to the proceedings. My one gripe is a small one, and that is that the dash move is mapped to the right bumper. It works perfectly fine but, as far as I can tell, the right trigger isn't used for anything and would make a far more comfortable fit. There might be an option to switch things around in the final build, though, so It's not worth fretting over at the moment. Growing up on the games that inspired Mighty No. 9, I went into this particular demo with my shields up. I was quickly disarmed though, as it became instantly obvious that the same DNA that flows through Mega Man's circuits has evolved and pulses at the heart of this new offering. Look for Mighty No. 9 to dash onto pretty much every console known to man on Sept. 15.